Background: Direct inhibition of coagulation factor XIa (FXIa) carries a significant promise for developing effective and safe anticoagulants. Method: In this report, we studied 4-methyl-2-oxo-2H-chromen-7-yl furan-2-carboxylate 1, a coumarin derivative, for direct FXIa inhibition. Results: This small molecule was found to inhibit FXIa with an IC50 value of 0.77 µM. 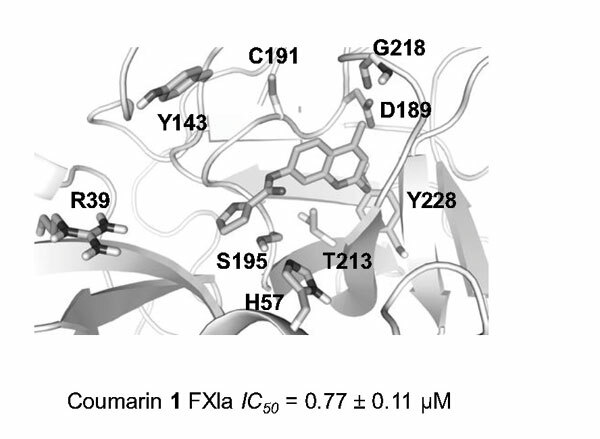 Coumarin 1 also displayed a moderate-to-high selectivity for FXIa inhibition over other coagulation, digestive, and fibrinolysis serine proteases. Coumarin 1 selectively doubled APTT of human plasma at a concentration of 72 µM. Insights about the structural features that contribute to the unique potential of such small molecule were deduced by profiling similar molecules in PubChem Open Chemistry Database as well as by performing a computational docking exercise. Conclusion: Overall, chromen-7-yl furan-2-carboxylate 1 is expected to serve as an excellent fragmental lead for further anticoagulant design and development. Factor XIa, anticoagulant, coumarin, active site inhibitor, clotting times, direct inhibition.